Join us at ‘Day at the Beach,’ our free monthly program for our kama’aina and visitors to the islands. Our trained volunteers provide adaptive surfing, flotation, and swimming for any person with a disability on the first Saturday of each month at White Plains Beach Park from 9 a.m. to 1 p.m (there are a few exceptions through out the year, please check our events calendar for any date and location changes). New participants simply need to fill out their waiver form at the bottom of this page. You only need to fill out this form once. There is no pre-registration for surf times prior to the beach day as we assign surf times at the beach. We recommend coming early as we often book up for surf times. After 11:30 surf times are no longer assigned. New volunteers can fill out their waiver form at the bottom of this page. You only need to fill out this form once. 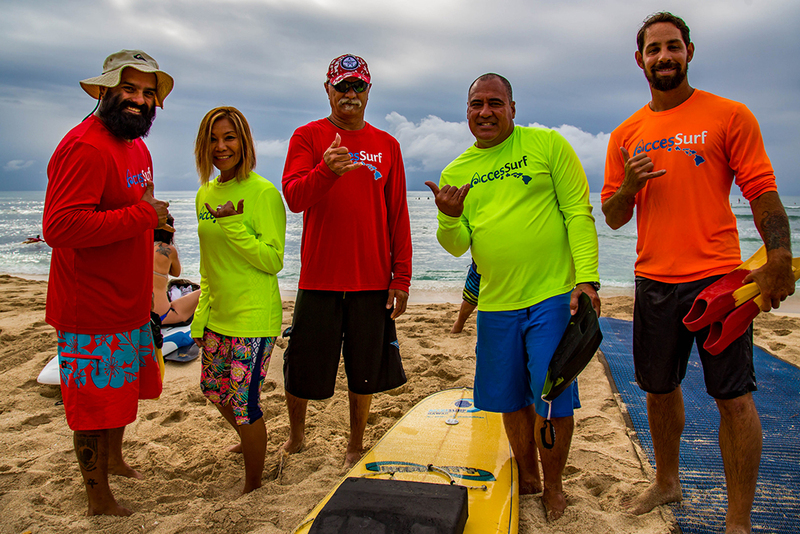 Volunteers are encouraged to show up beach ready (board shorts / swimsuit – AccesSurf provides rash guards, water, sunscreen). If you are a first time volunteer, you are required to attend our 8am orientation. We always need a lot of help at set up and tear down, and encourage volunteers to be able to stay for one or both. We love special groups, so then to ensure a meaningful experience for both our participants and volunteers we do schedule special groups in advance. If you are planning on attending with a large group of 10 or more, we kindly ask you to email info@accessurf.org so that we may properly accommodate you. Also, we ask that the group’s point of contact please ensure their group member’s have filled out their volunteer forms online prior to attending. Come and enjoy the therapeutic beauty of the ocean or just come and enjoy ‘A Day at the Beach’ meeting new people. To become a volunteer, attend our training at 8:00am the first Saturday of the month at White Plains beach park. Please complete our online volunteer form prior to attending the training.